Many believe that the yo-yo is a simple toy, but few people know that today there is a growing interest in the yo-yo as a full-fledged sport with its own rules, tricks and the growing skill level of players. It is impossible to perform different tricks with a yo-yo without a quality braided rope, which largely depends on ease of learning the game and the beauty of your tricks. Prepare materials for weaving, rope – buy at the hardware store long screw with a metal hook on the end, cut thick wire, drill; you will also need a skein of thread, the thickness of which is equal to one-eighth of the thickness of the finished rope for a yo-yo. The process of weaving of the rope may seem complicated at first glance, but in fact to weave this rope can each of you. Drill a hole in the wall and screw it into the wall the screw. From a piece of thick wire, bend the hook and insert it in the hole drills. Secure the hook in the same way as fixed in drill drill. Drill place at a distance of two planned future lengths of rope, and then take the thread from the spool and tie on the end of the thread loop. The associated loop throw the hook of the screw, is screwed into the wall and then hold on to threads of a drill. Pass the thread through a hook inserted in the drill instead of a drill, and then return the thread to the wall. Cut the tip of the thread and make a new end loop. Throw the second loop on the same hook in the wall. Now turn on the drill into the socket and pull the thread. Run the drill in clockwise rotation. After half a minute turn off the drill and check that you have turned – off the hook tightly spun thread and place it to one side, keeping the thread in a tense position. Repeat the above process three more times so that you get three twisted cord of two strands each. Take the four cords which will be in at the end, and secure the ends at the same time on the hook in the drill. The opposite ends of fasten on a hook in the wall. Then turn on the drill and tighten the laces in a clockwise direction. Remove the cord from the hook in the drill and then miss again the rope through the hook. Hold in one hand, the loop of the rope and the other hand holding the drill. Throw a loop on a hook in the wall, pulling the thread, and then screw the thread again, rotating the drill this time counterclockwise. After the rope is twisted throughout its length, remove it from the hooks, turn off the drill and cut the loops. At one end of the rope make a loop for your finger. The other end of the clip in yo-yo. In the early twentieth century the rope was no longer tied to the axle, and steel just to do a loop, making it possible to send the yo-yo to "sleep" (eng. to sleep — to sleep), in which toy some time spinning on the end of unwound rope. A possible play styles with the active collaboration yo-yo with a rope — other than in the classic "looping" (eng. looping — maintaining cycles). Styles tricks Yo-Uo. Looping (eng. loop — loop) — style game in which a player hand movements directs a yo-yo in an elliptical path around the arm; the main objective of stunt run "looping" is their long run without a return yo-yo in hand. 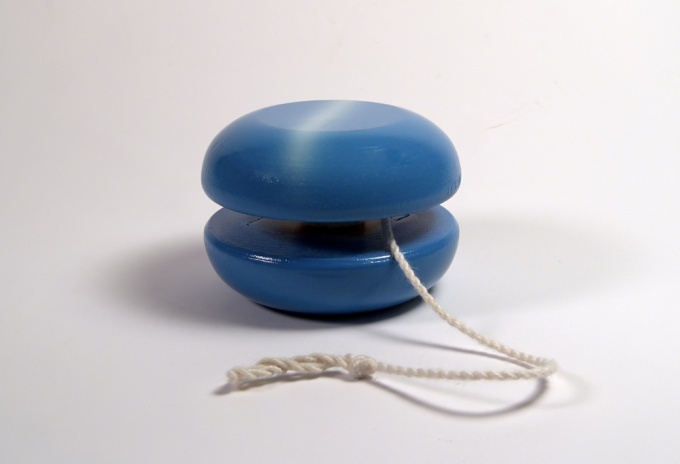 A simple "mount" is "a-line" — after the side throw the yo-yo rotates around the finger, not make a throw ("free hands") and lands on the rope.In yoyoing called the mount position,performed tricks.